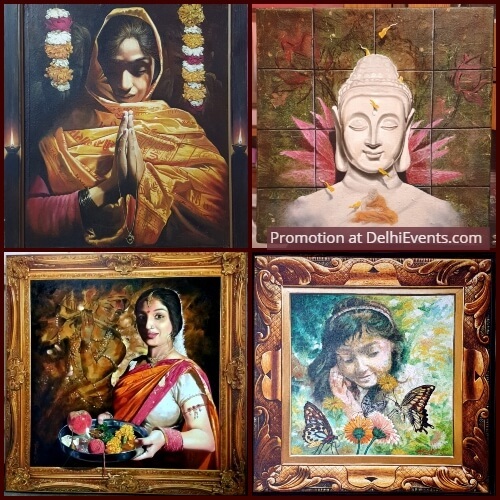 Event Description : ART EXHIBITION "Oneness - Art for Bridging Humanity" a group show of paintings. The exhibition "Oneness" goes far beyond unity, unity in diversity and uniformity. Here,artists are more concerned with the amalgamation of people with different thoughts and ideas yet creating art; the very soul of being humane. It is the Himalayas that beckon us with a sort of magnetic pull to walk deeper and deeper into their beauty. Born and bred in the lap of snow driven glens, the twelve artists have come together to bestow people with the serenity and delicacy of the perennial beauty. Splashing colours drawn from the bounty hills, the artists have set in stone to embrace the plains. With a belief that art has the power to bridge humanity, a rejuvenating set of paintings The twelve artists working in different styles have come together with a hope to provide a connection between the artists and the art lovers. A weekly-long exhibition at All India Fine Arts and Crafts Society, Delhi and showcasing the recent works by the members of Mahsu Art, a Shimla-based society dedicated to the promotion of contemporary Indian Painting and uniting both established and budding artists, is sure to attract the art lovers' attention and acquaint them with a wide range of modern India artistic expressions. Collectively and separately, the members of the group have many a time successfully exhibited at the international Roerich Memorial Trust, Naggar, Kullu, Himachal Pradesh . The exhibition displays the masterful monochromatic explorations of motion by the doyen of modern India art scene Trithankar Biswas, and the profound impressions of the timeless Himalayan landscape by the Shimla-based artist Prof. Him Chatterjee chairing the Department of Visual Arts of the Himachal Pardesh University. Touching on more contemporary themes in a series of rather philosophical works, Chaman Sharma explores the impact of modern technology on the traditional Himachal society, while Bhader Singh displays a part of his extensive series on temple bells resounding with Nada, the eternal whisper of the Universe. The exhibition also Introduces a number of works by the young members of Mahsu Art executed in a great variety of techniques and media. These include glimpses of the fleeting mental sates by Neeraj Jangra , the ageless indian monuments and artefacts brought to the life by Pinki Saini, Manisha Bhatia's philosophical reflection on lantern as a symbol of the source of light, and the abstract expressions of the word of ideas of modern youth by Tirthankar Biswas’s allegorical work combines the linear elegance and the humanistic narrative. Employing palette of largely neutral hues, Biswas creates alchemistic turns of life through some utterly graceful figures. Characterized with its sacredness : over the past few years, the artist has been moving freely between the mountains and offering to people with the sanctities of nature through his canvas. Merging the aesthetics of Indian heritage and values, Dr Sharma’s tranquilizing watercolours as well as the paintings in mixed-media are vibrant, enthralling and dreamy, outlined by a notion of artist’s fanciful landscapes and heavenly life. Like the newfound chumminess of kindergarteners emerging from a arm-in-arm and candy-eyed innocence, Anvita Chatterjee finds her piece of art among the little ones. Depicting the actual tableaux of humankind. Exploring the concept of origin, the cadenced movement of the bells try to caress everything animate and inanimate with the power of creation. The compound stratum of quest, reality, and nativity undergirds the acrylic paintings of the Dr Bhader Sing Layered with fictitious figures and designs, Manisha Bhatia tries to find her utopia. With a hint of day peep in her aphotic pieces of art, she sequentially tries to discover the ultimate reality. The bold-hued, unravelled shapes of Neeraj Jangra’s paintings thwart any stable meaning. Each painting seem less a visual manifestation of a single concept or thing than a vessel for the constellation of intertwined ideas. Unlike more fully abstract works in which countless referents can be found, his paintings steer viewers toward the genuine yet helical way of life. Motivated by a sincere belief in painting’s ability to elicit transformative aesthetic experience, she aims to slow viewers down and trap their gaze Pinki Saini realistic characters serve as a way to apprehend the idea less of nature and its beings. The paintings of TseringYoudol suggest the aesthetics of Buddhism, the beckoning figures of Buddha and floral patterns. The compositions manage to picture the different postures of Buddha implying ethereal tranquillity and placidity Puran Thapa's watercolour paintings depicting forests, glens and architecture, mostly in vibrant colours anchor the viewers to the aurora of life. While the compositions of dense mark-making and contrasting patterns and colours can easily foster, the paintings elicit a true's prosperity. Aditya Singh Thakur’s oeuvre is identified by its abstruseness. His typically battered and abject looking figures convey an eerie mood as well as an unexpected elegance. Whether the theme is love, war or death; myths have provided the artist a rich source of visual and conceptual material for the canvas. Jamuna Gurung capturing the gestures and sensibility, the distinct stances of the human figures convey a sense of melancholy. Despite an atmosphere of relative contentment, there often is a feeling of unsolicited wantonness in her paintings. Apart from the solo shows, the group has been working together and has put up various exhibitions in The Gaiety Theatre (Shimla), Solan, International Roerich Memorial Trust (Kullu), Khajuraho and Jaipur.